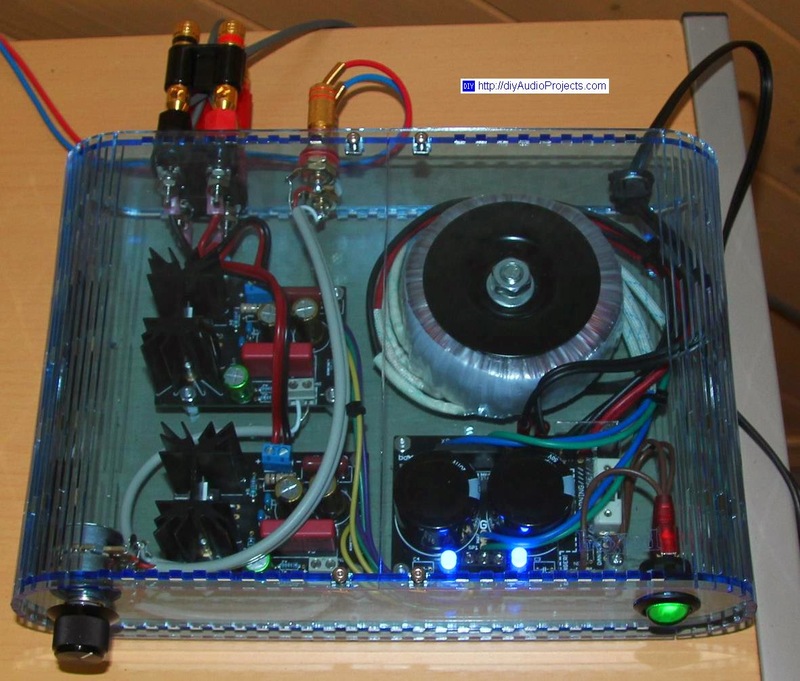 The sharp looking amplifier below is the Gobo Stereo Audio Amplifier from boxkedkitamps.com which is sold as DIY kit. We have completed a review of the Gobo LM1875 stereo amplifier kit which is available on the main site. 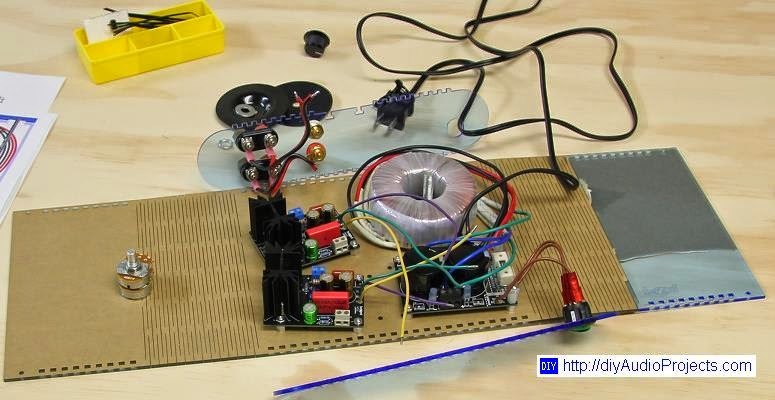 The Gobo kit is a class-AB chip amplifier kit that uses the LM1875 IC. The LM1875 amplifier kit includes all the required parts and enclosure to build a complete stereo amplifier. The kit comes with a very detailed step-by-step instructions that make it possible for a first time amp builder with only soldering skills to complete the kit. The amplifier kit comes with good quality parts like audio-grade capacitors from Nichicon Muse, Panasonic and WIMA. The linear power supply for the amplifier kit makes use of a audio-grade toroidal transformer from Antek. The completed kit really looks great. The enclosure of the LM1875 amplifier kit is made from translucent blue acrylic plastic. The rounded sides of the enclosure are very precisely laser cut hinges that allow you to bend and fold the plastic over to form the enclosure. Above, the finished Gobo LM1875 is matched up with a pair of Fostex FE206E back-loaded horn (BLH) speakers and a NAD C516BEE CD player. The amplifier is very accurate and neutral with strong and accurate bass response. The midrange and top end response is extended and sounds natural and detailed with no coloration. Coupled with sensitive single-driver loudspeaker systems the combination is very revealing of recordings. For the full details of the DIY kit, see our review of the Gobo LM1875 stereo amplifier kit. Looks nice! I didn't know about BoxedKitAmps until now.